Murder by Gaslight: Murder Pamphlets. Americans have always loved a good murder story. The first book published in Boston, in 1675, was The Wicked Man’s Portion, a sermon about two men who were executed for murdering their master, and for at least the next two and a quarter centuries the public’s desire to read about killing was satisfied by cheap, sensational, paperbound murder pamphlets. The earliest examples, following a tradition that began in England, were one page broadsides sold at the murderer’s hanging, containing sermons relating to the crime or the transcribed confession of the condemned man. They were often decorated with images of coffins or the hanging man, and their sale was justified on the grounds that they served as a warning against living an immoral life. By the nineteenth century sermons were, for the most part, gone from murder pamphlets but the pamphlets still served to demonstrate the wages of sin to the God fearing. They had also grown in size; by midcentury the average pamphlet was twenty-four pages long, while pamphlets for some sensational murders could be more than fifty pages long. They almost always included the condemned man’s confession (or statement if he was still professing innocence.) They might also include the background of the crime and those involved, and a summary of the trial or trials that convicted the killer. If the execution had already taken place, a description of that event might also be included. 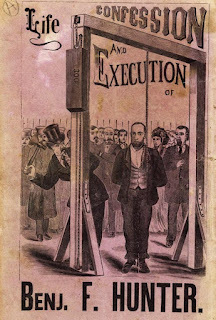 The pamphlets were usually illustrated with an artist’s rendering of the killer and his or her victim, and could include illustrations depicting the crime itself or the killer’s execution. While always interesting to read, murder pamphlets should not be considered unbiased sources of fact. The titles alone are usually sufficient show the author’s sentiments. For example, Trial of Joseph Lapage French Monster for the Murder of the Beautiful School Girl, Miss Josie Langmaid... and Life, Confession and Atrocious Crimes of Antoine Probst, the Murderer of the Deering family. make no attempt at objectivity. 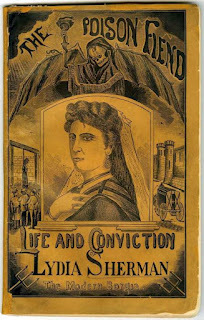 While the pamphlets were more often biased against the accused, sometimes they were used by the condemned man to declare his innocence or justify his actions. In part 1 of Love and Law in Two parts, Charles Kring explains the shame and betrayal that led him to shoot Dora Broemser. In part 2 he documents his ill-use by the Missouri legal system. Sometimes murder pamphlets were used to advance a political agenda. 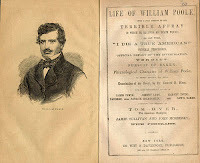 Life of William Poole with a full account of terrible affray in which he received his death wound; his last words "I die a true American." Relates the story of the murder of Bill “The Butcher” Poole, who was considered a hero by the Native American, or “Know Nothing” Party. The Confession of the Murder of William Morgan. served the needs of the Anti-Masonic Party. Morgan had been abducted by Freemasons more than twenty years earlier, but it was never proven that he was murdered. Even the portraits of the murderers are not to be trusted. 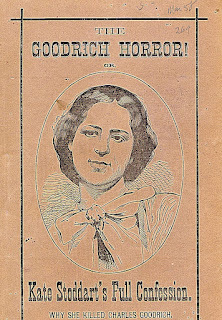 The picture of Kate Stoddard on the cover of The Goodrich Horror! 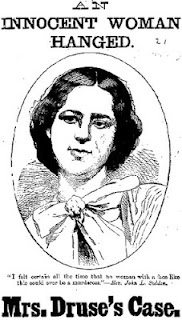 or Kate Stoddard’s Full Confession in 1873 was used again in 1884 on An Innocent Woman Hanged, as a portrait of Roxalana Druse. 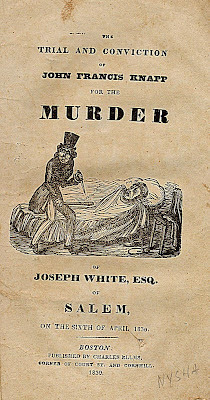 By the end of the nineteenth century murder pamphlets had grown to resemble modern paperback books. 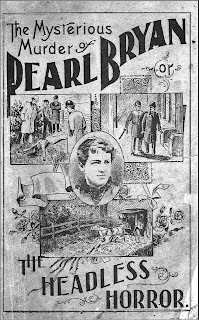 Pearl Bryan’s murder in 1896 spawned three large pamphlets: The Mysterious Murder of Pearl Bryan; or The Headless Horror, 125 pages, Headless Yet Identified, 146 pages; and Pearl Bryan; or a Fatal Ending, 94 pages. The Fall River Tragedy. A History of the Borden Murders. in 1892 was a whopping 312 pages. 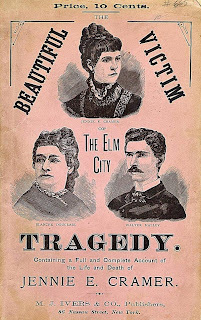 Murder pamphlets disappeared in the twentieth century as full-fledged books on murder and true crime became a staple of American popular literature. McDade, Thomas M.. The annals of murder; a bibliography of books and pamphlets on American murders from colonial times to 1900.. [1st ed. Norman: University of Oklahoma Press, 1961. I guess now people get their quotient on the nightly news, or YouTube. Do you have any idea how well they sold? One reason I ask is I've been trying to get an idea what the market for wood engravers was at the time. There must have been so many, what with the weeklies like Harper's, etc. Thanks Bob. I don't know how many copies were sold but _The Annals of Murder_ lists 1126 distinct titles between colonial times and 1900. The fact that so many have survived makes me think the printings were large. I'll bet a decent engraver would not have trouble finding steady work.